I don't know if it's bad form to begin by stating the obvious, but there really is no digital retail success story greater than Amazon's. The figures lay it down bare. There are 310 million active Amazon customer accounts worldwide, 90 million of which are Amazon Prime members who spend an average of $1,300 per year on the platform, with the remaining 220 million non-Prime members spending an average of $700. Put it all together and you've got the most popular and most valuable online store in the US by far. Annual net ecommerce sales of physical goods totaled $52.8 billion in 2017 - nearly four times that of Amazon's closest ecommerce rival Walmart - which, combined with Amazon's service sales, gives the company a brand value of $139.29 billion. These are jaw-dropping figures indeed. Though, what is perhaps most remarkable is that they are not at all surprising. We have all heard of Amazon, and I'd be willing to bet my Kindle that each and every one of you who is reading this blog will have bought something from the site before, or at least know 10 others who have. The popularity of Amazon is nothing short of phenomenal, and the gargantuan e-tailer has managed to muscle its way into practically every aspect of our lives - from the books on our shelves to the devices in our pockets and the parts in our cars. The question has to be - how on earth did it do this? Well, in truth, the story of Amazon's success comes down to a variety of factors. But one thing in particular that the company has got right time and time again over the years is its handling of social media - which indeed it seemed to master even before such a thing truly existed. We'll begin by considering Amazon's reviews system. Online customer reviews are practically synonymous with Amazon. Indeed, garnering buyer reviews has always been fundamental to the Amazon strategy. As anyone who has ever used the site will know, reviews are promoted throughout - both before and after purchase. Every item that's listed on Amazon has a star-rating - awarded by Amazon customers - and is normally accompanied by numerous reviews left voluntarily by previous buyers of the same product. Buyers, incidentally, can also leave reviews of sellers. Reviews have always been critical to the Amazon model. Since buyers cannot touch or test a product before they commit to a purchase, previous customer appraisals provide accountability, and serve as an indicator of quality for buyers who would otherwise just have to take the seller at his/her word. But, equally important, is the fact that reviews generate genuine consumer engagement with the platform. Indeed, the highly active customer reviews columns found all over Amazon.com could almost be described as a consumer-driven social network in its own right. Customers get to know their favorite sellers and engage with them. They also get to know their favorite reviewers and trust their opinions, star-ratings, and recommendations. To make product reviews even more useful to customers, Amazon also enables community moderation by encouraging customers to vote on the usefulness and relevance of each review that's left, and shoppers can even post follow-up questions directly to the reviewer. And of course, the Amazon algorithm is in a constant state of up-sell - 'Customers who viewed/bought this item also viewed/bought that item', buyers are notified at practically every turn. All of this engenders true interaction with the Amazon.com platform. Indeed, it's more than just an online retail site, it's a community that Amazon has now been nurturing for 24 years. And so it's no surprise that when social media took off in the past decade or so, Amazon knew exactly how to play the online community game to its advantage. Amazon currently has over 28.7 million likes on its Facebook page. An incredible figure, but if you take a quick scroll down its news feed you can see why it's so popular. 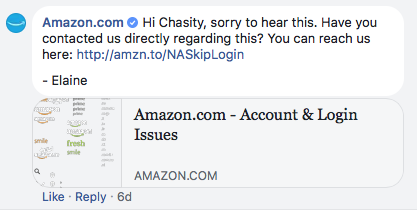 Amazon replies to a staggering amount of comments left on its posts - and it does so quickly, politely, provides useful information and links, and adds the human touch by addressing commenters by first name, with the Amazon employee signing off each comment using their first name also. When someone asks a question, Amazon answers it. If someone expresses a frustration, a response is quick and helpful. And Amazon also creates and contributes to conversations, which is imperative for brand success on social media. Indeed, in keeping with the social aspect of Amazon's social media efforts, customers with Facebook-connected accounts will see product reviews written by their Facebook connections appear in their feeds, as well as products their connections have put on their Amazon Wish Lists (so you know what you can buy them for their next birthday - directly from Amazon, of course). Promotions-wise, Amazon also uses Facebook to highlight products, and offers date-related coupons and discounts to encourage sales. When Mother's Day is just around the corner, the Facebook page becomes awash with gift ideas and discount coupons to purchase them - followers, who were likely going to buy a gift online anyway, have no need to look elsewhere. Amazon's Twitter campaign is today less heavy on promotions than it used to be, and instead serves as a vehicle for driving its 2.7 million followers towards Amazon's additional services such as Prime Video and Amazon Music. The Amazon Twitter feed is also used to promote the company's blog content - a lot of which offers small business advice to those selling on Amazon - and deliver news about the various things and innovations the company is involved with and up to. Essentially a platform for content marketing rather than driving direct sales, Amazon's activity on Twitter nonetheless serves to create and nurture an engaged community of customers, and encourage as many as possible towards Prime membership. Pinterest for Amazon is essentially an extension of its main online store. Pinterest is of course the one social media site where a significant percentage of users go to browse for purchase ideas. But when they find a Pin from Amazon, they can simply click on it and are taken either straight to a page on Amazon.com where they can purchase the product directly, or otherwise to the seller's own website from where the customer can complete the purchase via Amazon. Amazon also uses Pinterest to promote bespoke lines, such as Handmade at Amazon, Amazon Home Services, and Amazon Style for Women. It's all very carefully set up to drive Pinterest users towards Amazon purchases - and it works. Last year, Amazon even went so far as to launch its own Instagram/Pinterest-like Amazon Spark, which could be described as a social network for shopping. 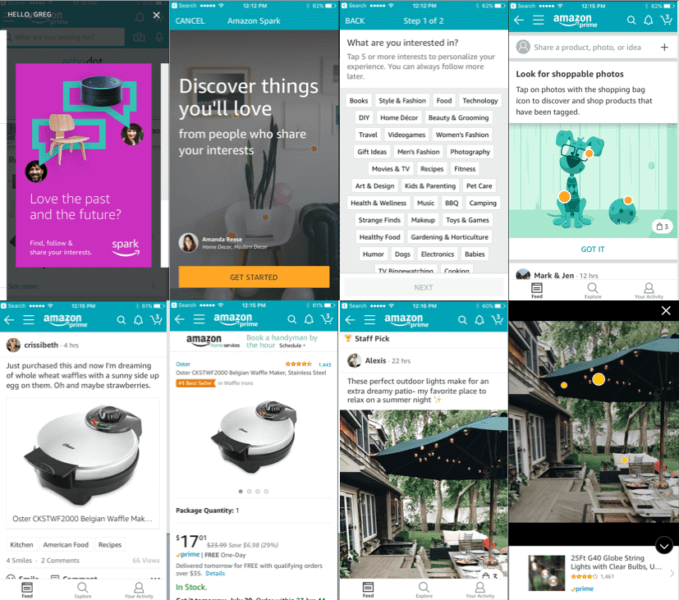 Residing within the Amazon app, Spark is designed to create social engagement that will lead directly to product purchases. When users sign up, they are asked to identify topics of interest from an extensive menu, which includes product categories as well as lifestyle areas such as travel, art & design, fitness, and so on. Users then receive images of products and other items of interest in a shoppable news feed, where they can leave comments, make recommendations, and of course click through to make a purchase. Aside from being yet another social channel through which Amazon can drive direct revenue, Spark also generates data, and gives the company a whole new set of signals for customer targeting that it can use further down the line. Of course, Amazon already knows what its users search for and buy, but with Spark, it can also learn more about their interests and aspirations, all of which can be used to inform targeted ad campaigns in the future. Amazon has always believed in a thriving and engaged community, even before the advent of social media. But through the extensive utilization of Facebook, Twitter, Pinterest, and now its very own Spark network, one of Amazon's keys to success is to promote itself and its products across a plethora of social channels, and facilitate conversation, engagement, and discovery among its millions of followers.